Home / Entertainment / Why Did Sharon Osbourne Have a Double Mastectomy? It’s been a year of high and lows for America’s Got Talent judge and The Talk co-host Sharon Osbourne. Sharon and Ozzy celebrated their 30th wedding anniversary, her son Jack got married, and he and wife Lisa Stelly just gave Sharon her first grandchild- Pearl. But Jack was also diagnosed with multiple sclerosis in June, and she quit America’s Got Talent after because she was not happy about the way NBC cancelled Jack’s appearance on a reality show after his diagnosis. And now Sharon has revealed that she underwent a bilateral mastectomy last summer when she found out that she carries the breast cancer gene. Sharon and Ozzy both had their genomes analyzed, and while Ozzy’s came up clean, hers revealed that she had both the colon cancer gene (which she was diagnosed with 10 years ago) as well as the breast cancer gene. As soon as I found out I had the breast cancer gene, I thought: ‘The odds are not in my favour.’ I’ve had cancer before and I didn’t want to live under that cloud: I decided to just take everything off, and had a double mastectomy. For me, it wasn’t a big decision, it was a no-brainer. I didn’t want to live the rest of my life with that shadow hanging over me. I want to be around for a long time and be a grandmother to Pearl. They’re very small now…[but] I’m happy with them… I just wanted to be cancer-free. 1. BRCA1 and BRCA2 are human genes that belong to a class of genes known as tumor suppressors. In normal cells, BRCA1 and BRCA2 help ensure the stability of the cell’s genetic material (DNA) and help prevent uncontrolled cell growth. Mutation of these genes has been linked to the development of hereditary breast and ovarian cancer. 2. Not all gene changes, or mutations, are deleterious (harmful). Some mutations may be beneficial, whereas others may have no obvious effect. Harmful mutations can increase a person’s risk of developing a disease, such as cancer. 3. A woman’s lifetime risk of developing breast and/or ovarian cancer is greatly increased if she inherits a harmful mutation in BRCA1 or BRCA2. Such a woman has an increased risk of developing breast and/or ovarian cancer at an early age (before menopause) and often has multiple, close family members who have been diagnosed with these diseases. 4. 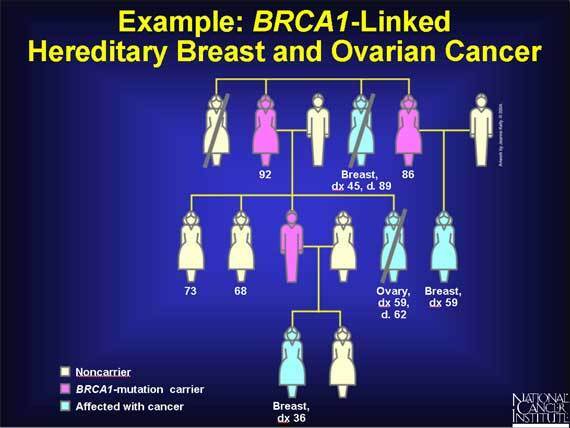 The likelihood that a breast and/or ovarian cancer is associated with a harmful mutation in BRCA1 or BRCA2 is highest with a family history of several members with breast and/or ovarian cancer. 5. But not every woman in such families carries a harmful BRCA1 or BRCA2 mutation, and not every cancer in such families is linked to a harmful mutation in one of these genes. Not every woman who has a harmful BRCA1 or BRCA2 mutation will develop breast and/or ovarian cancer. 6. According to estimates of lifetime risk, about 12.0 % of women (120 out of 1,000) in the general population will develop breast cancer sometime during their lives compared with about 60 percent of women (600 out of 1,000) who have inherited a harmful mutation in BRCA1 or BRCA2. In other words, a woman who has inherited a harmful mutation in BRCA1 or BRCA2 is about five times more likely to develop breast cancer than a woman who does not have such a mutation. 7. Lifetime risk estimates for ovarian cancer among women in the general population indicate that 1.4 %(14 out of 1,000) will be diagnosed with ovarian cancer compared with 15 to 40 % of women (150–400 out of 1,000) who have a harmful BRCA1 or BRCA2 mutation. 8. There are three specific mutations, two in the BRCA1 gene and one in the BRCA2 gene, that are the most common mutations found in the Ashkenazi Jewish population (those of Eastern European descent). 10. Currently, there are no standard criteria for recommending or referring someone for BRCA1 or BRCA2 mutation testing. 11. In a family with a history of breast and/or ovarian cancer, it may be most useful to test a family member who has breast or ovarian cancer first. If that person is found to have a BRCA1 or BRCA2 mutation, then other family members can be tested to see if they also have the mutation. 12. A positive test result generally indicates that a person has inherited a known harmful mutation in BRCA1 or BRCA2 and, therefore, has an increased risk of developing certain cancers. However, a positive test result provides information only about a person’s risk of developing cancer. It cannot tell whether an individual will actually develop cancer or when. Not all women who inherit a harmful BRCA1 or BRCA2 mutation will develop breast or ovarian cancer. 13. Having a negative test result does not mean that a person will not develop cancer; it means that the person’s risk of cancer is probably the same as that of people in the general population. 14. Several options are available for managing cancer risk in individuals who have a harmful BRCA1 or BRCA2 mutation. Surveillance—Surveillance means cancer screening, or a way of detecting the disease early. Screening does not, however, change the risk of developing cancer. The goal is to find cancer early, when it may be most treatable. Mammography and clinical breast exams may be performed every 6 months. Prophylactic Surgery—This type of surgery involves removing as much of the “at-risk” tissue as possible in order to reduce the chance of developing cancer. It greatly reduces but can not completely eliminate the risk of developing cancer. Chemoprevention—This approach involves the use of natural or synthetic substances to reduce the risk of developing cancer. For example, the drug tamoxifen has been shown in numerous clinical studies to reduce the risk of developing breast cancer by about 50 percent in women who are at increased risk of this disease. I am currently enrolled in a course titled Medicine and Media at Rice University, in which we explore the intricate portrayals of medicine in media throughout time, and how these portrayals shape our perceptions of the field of medicine. A topic we discussed at great lengths in the course is the importance of patient narratives in treatment and diagnosis of health ailments. The ways in which physicians interpret these narratives and translate their significance into electronic medical records have many implications for adequate patient treatment. What Sharon Osbourne has done with her story is turn it into a narrative by contextualizing her breast cancer: she tells us about her husband’s struggle, her children and, her new granddaughter. There are reasons beyond “textbook” medicine for why she underwent her bilateral mastectomy. By being able to sense the social and moral meanings behind her surgery, we are able to relate to her journey—a concept that feeds into public health based teaching moments in the media. Megan Morris, one of the chief medical researchers for the popular TV show Grey’s Anatomy was a guest lecturer for one of our classes. Megan’s job is to create story ideas that are medically realistic, factual and socially relatable. Megan also stressed how important it is for her to accurately portray the social meanings of a particular disease or condition because her audience depends on these portrayals. Media connections, via celebrities and TV shows, that utilize narratives to depict and humanize medical conditions simultaneously act as channels to educate people about facts related to these conditions are critical for public health. 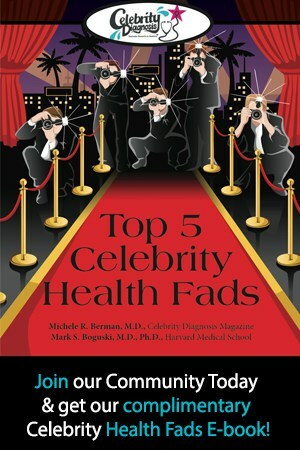 Celebrities can potentially help put the spotlight back on patient narratives, an art that needs all the help it can get in the coming technology-driven, digital age of medicine. This article on Sharon Osbourne’s decision to have a double mastectomy as well as the above comment explore important aspects of genetic sequencing, participatory medicine, and surgical modification of self. Certainly, contextualizing Sharon Osbourne’s experiences (which include previous experiences with cancer, reaching significant family milestones, dealing with family members’ diagnoses, and a faulty aesthetic surgical implant) help to explain her decision to pursue what may regarded as a dramatic medical decision. However, her case does illustrate the benefits of patient empowerment. By proactively sequencing her genome, Sharon Osbourne was able to combine the information acquired from the sequencing with her past colon cancer experience and her earlier decision to have breast implants in order to ultimately decide to have a double mastectomy. Sharon Obsbourne’s decision reveals the potential that genomic sequencing has in leading effective preemptive treatments. However, her story also reveals the caution with which surgical alterations ought to be viewed. The article reveals that Sharon Osbourne had opted to have breast implants, and ultimately, the fact that these implants were faulty, i.e. leaking into the wall of her stomach, factored into her decision to have a double mastectomy. These implants reflect the fact that while plastic surgery may offer an “improvement” in appearance, the procedures themselves are subject to the same risk as any other medical procedure. In fact, surgical aesthetic procedures can be regarded as more problematic as they do not seek to correct existing problems but rather perceived flaws. Regardless, Sharon Osbourne’s decision serves as a prominent example of genetic sequencing used to inform medical practice. Breast cancer awareness has been heavily promoted over the past decade or so, but the genetic factors that contribute to it have received much less attention. Almost everyone knows what the pink ribbon stands for, but I would wager that very few know the BRCA gene by name. It is refreshing to see the BRCA gene get more attention as a tool for preventative medicine and saving lives. The publicity provided by Osborne compounds with the publicity of the gene that came with the episode of Grey’s Anatomy titled “Let It Be,” in which a woman who discovers that she has the gene also undergoes a double mastectomy. Since so many Americans get their health information from the internet and television, publicity of the gene will play an important role in preventing future cases of cancer. With some of the information presented being less than accurate, it is refreshing to see a blog that combines pop culture with reliable scientific information. In addition, as gene sequencing becomes more popular, more lives will be saved. Although it doesn’t provide a definitive answer, as mentioned in the article, it can alert patients to an increased risk and help them seek testing or treatment. Positive publicity like this will raise awareness for sequencing, but I hope that consumers seek out reliable tests, as there are many do-it-yourself gene sequencing tests available for purchase that may or may not be reliable.